This happens extensively in the "Started problems" section and to some extent in "Favourites" section. This causes the problem started 25-30 days back to get buried under about 40 such notification tabs.This demands you to scroll a lot to reach the problem and also to eventually forget about that started problem. 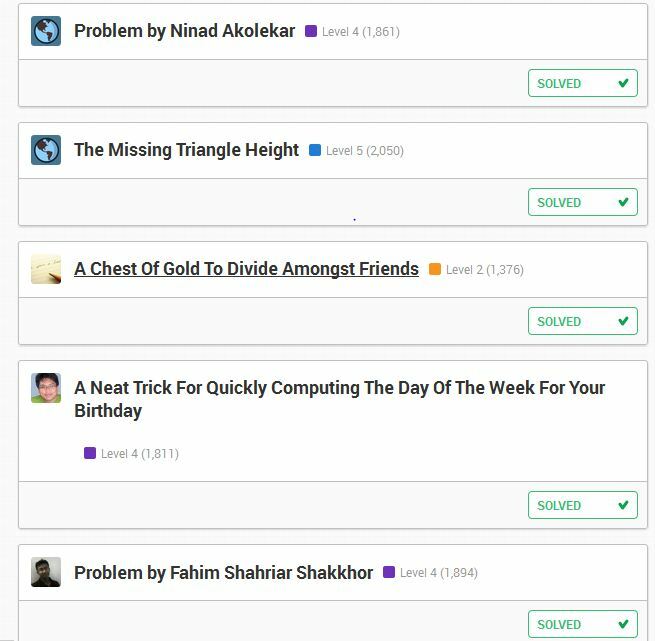 Thus it would be convenient if these solved problem tabs appeared in a different section like "Solved Problems" section. I don't understand why so ? It should be that--when I have solved a problem, I view the solution by others and then post my solution if it differs from what others already have posted or is easier and elaborate than someone else's. This would-- stop the redundant solutions of the same kind...give way only to good solutions. Yes, we are working on making the solved problems more compact, and perhaps appearing only in a "solved problems" page. Currently, the process is: Solve the problem correctly, write your solution, and then view other the solutions of others and decide if yours helps the conversation. We don't want people posting solutions that are only slight edits of solutions written by others. Does that make sense? First of all, Thanks for the reply ! Silas, you said that you don't want people posting solutions that are only slight edits of solutions written by others. But in fact this is what is happening ! I have seen so many solutions which are all the same...only the wordings differ( I have mentioned them in my note as "redundant solutions" above). Current system invites redundancy.So again...one has to read through all those about 20 solutions to find the best one. You get the right to write the solution only if you've answered the problem correctly, which is presently the case, the only change being that.....you can view the solutions by others before you post your own. This will help you decide if your solution will further help...if yes you post it...if better is already there you don't post yours. This in my view will stop repeated solutions and we'll have to go through less of them to find the best.